Indeed, if the election were held today, it would be Klaver’s GroenLinks (and not Wilders’s PVV) that could make the largest net gains in the election, contrary to conventional wisdom. Though they share in common somewhat flamboyant hair, Klaver couldn’t be more different in background or politics from Wilders. Whereas the platinum-maned populist has campaigned around the country referring to Moroccan scum and, infamously, was convicted last year of inciting discrimination after disparaging Moroccan immigrants, Klaver’s own father is Moroccan. (His mother’s background is Indonesian; Klaver grew up in public housing, raised chiefly by his grandparents). Klaver, first elected to the Dutch parliament in 2010, became the party’s floor leader in 2015, and he quickly staked a role promoting higher spending, universal basic income, aggressively pursuing corporate tax evasion, and ‘green’ schemes designed to boost environmental quality. For example, Klaver wants to charge drivers a nominal fee of three cents per kilometer that rises to 15 cents during peak traffic hours). Klaver’s success is possible because of the collapse of the center-left Partij van de Arbeid (PvdA, Labour Party), which won a staggering 38 seats in the 2012 election. Five years ago, Labour’s then-leader Diederik Samsom campaigned on a stridently anti-austerity platform. After that election, however, Labour quickly joined forces with Rutte’s budget-cutting liberals. While it’s always politically challenging to serve as the junior member of a governing coalition, Labour almost immediately angered its leftist voter base. Jeroen Dijsselbloem, the Labour finance minister and the president of the Eurogroup, is a leading face of the austerity-driven neoliberalism that’s come to dominate EU-wide fiscal policy. Even under Labour’s new leader, the party could lose more than two-thirds of its seats. Lodewijk Asscher, deputy prime minister and minister for social affairs and employment, challenged and defeated Samsom for the Labour leadership last December. Though Asscher wanly echoes some of the same anti-European and anti-migrant sentiments that Wilders blares at every campaign stop, voters grumble that Asscher — who throughout the campaign literally remains Rutte’s deputy prime minister — is still part of the same elite that caved to Rutte’s austerity. Labour’s implosion and the continued euroscepticism of Emile Roemer and the left-wing Socialistische Partij (SP, Socialist Party) have together cleared a path for Klaver to become the clearest pro-European and anti-austerity voice in the 2017 election. He scored points at a debate last week, for example, when he tried to force Asscher to pledge not to join another Rutte-led coalition. (Asscher refused). 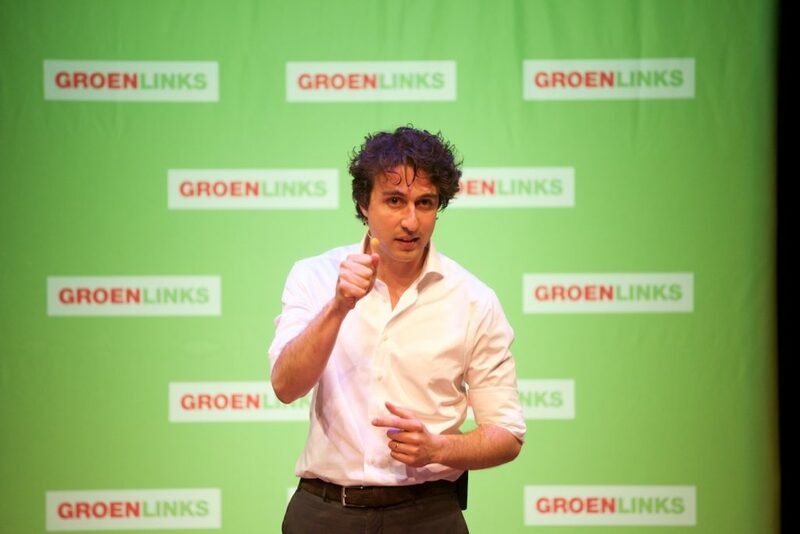 For a party that has its roots in the communist left, Klaver’s GroenLinks increasingly join a socially liberal and economically progressive trend across Europe that is eclipsing more moderate center-left and social democratic parties. GroenLinks formed in 1989 as a merger of four older parties, uniting Dutch communists, socialists, radicals and left-wing evangelicals within the same, sometimes unwieldy coalition. Under its leader Paul Rosenmöller, who spoke out forcefully against xenophobia in the 1990s, the party peaked at 11 seats after the 1998 election. Under Femke Halsema, the Green-Left leader for much of the 2000s, the party somewhat moderated, moving further into the mainstream and closer to the liberal and broadly pro-European tradition shared both on the right (such as Rutte’s VVD) and on the left, including the Democraten 66 (Democrats 66), another centrist party that could win up to 20 seats and is a more likely coalition partner for Rutte after March 15.